THE HAGUE, June 26. /TASS/. Russia, Syria and Iran on Tuesday refused to adopt by consensus Britain’s draft resolution, proposed at a conference of Chemical Weapons Convention member-states, for expanding the OPCW powers enabling it to name those responsible for the use of chemical weapons, a TASS correspondent reports from the conference hall. Russian, Iranian and Syrian delegates demanded holding discussions on these proposals and postponing the voting for 24 hours in accordance with the OPCW rules of procedure. "Russia is against consensus voting. Britain’s proposals must be discussed first," said the chief Russian delegate, Deputy Industry and Trade Minister Georgy Kalamanov. After that the conference’s chairman, Morocco’s representative at OPCW Abdelouahab Bellouki said the voting was postponed till June 27. The current conference of the Chemical Weapons Convention participants was convened by Britain, which is keen to empower to OPCW to name those responsible for the use of chemical weapons. Currently the OPCW has the right to provide experts’ technical conclusions. 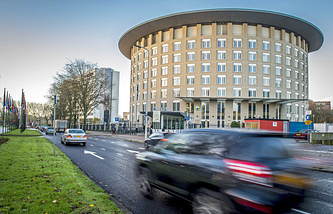 As a source explained to TASS on the sidelines of the conference London in fact tries to hand over to the OPCW, which is under a strong influence of the Western countries, some functions of the UN Security Council, which enjoys the right to attribute responsibility for chemical weapons attacks.